M Mushfiqul Fazal from New York, May 17 (Just News): The United Nation expressed its concern over the murder of Buddhist monk Mong Shu You in Bangladesh. He was slaughtered inside the temple by unknown miscreants at Chakpara under Naikkhanchhari upazila of Bandarban district on Saturday. To overcome the crisis of Bangladesh, Assistant Secretary-General for Peacebuilding Support Oscar Fernandez-Taranco will again start his mission for meditation, the top organization hints. On Monday in the daily press briefing of United Nation, this Bangladeshi journalist asked that, A Buddhist monk named Mong Shu You has been slaughtered inside the temple by unknown miscreants at Chakpara under Naikkhanchhari upazila of Bandarban district on Saturday. It is the common phenomena of Bangladesh now. On the other hand, Government is filing charge against the main democratic leaders of Bangladesh, former Prime Minister of Bangladesh, Begum Khaleda Zia, and Senior Vice-Chairman Tarique Rahman, and all rank and files, they are facing hundreds of cases. Oscar Fernandez‑Taranco was assigned by the Secretary‑General, just I wanted to know, still he's working for the Secretary‑General on his behalf to restore democracy in Bangladesh and for participatory, inclusive election and Bangladesh to build in a right track? In reply deputy spokesperson for secretary general Farhan haq said, Oscar Fernandez heads our peacebuilding support office, and that is the work that he does. He has travelled to Bangladesh in the past, and he will do so again as circumstances allow. Ultimately, that depends, of course, on the willingness of the parties to deal with each other. 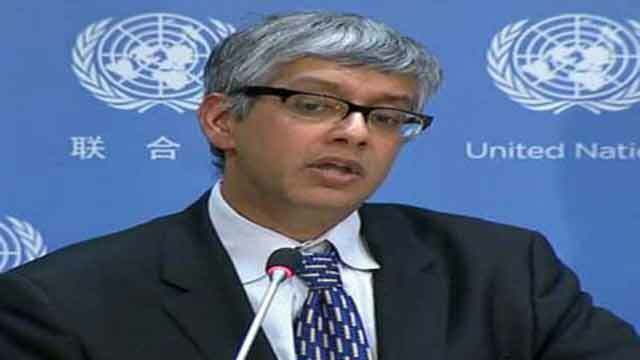 Terming the monk murder as an ‘extreme concern’ deputy spokesperson said, We regard, of course, the question of the deaths of different people, including of secular activists, of people from the Hindu and Buddhist communities and others with extreme concern. That's essentially a separate issue, where you've seen attacks by extremist elements against different communities. And you'll have seen the concerns that the Secretary‑General and the High Commissioner for Human Rights have expressed, and we reiterate those again today. Question: Thank you, Mr. Farhan. A 75… on Bangladesh, a 75‑year‑old Buddhist monk has been hacked to death in south-eastern district of Bangladesh, and this is the common phenomenon of Bangladesh. Every day it's going on. Just day before yesterday this happened. And the Government… on the other end, Government is filing charge against the main democratic leaders of Bangladesh, former Prime Minister of Bangladesh, Begum Khaleda Zia, and Senior Vice-Chairman Tarique Rahman, and all rank and files, they are facing hundreds of cases. So, has Assistant Secretary‑General… Mr. Oscar Fernandez‑Taranco was assigned by the Secretary‑General, just I wanted to know, still he's working for the Secretary‑General on his behalf to restore democracy in Bangladesh and for participatory, inclusive election and Bangladesh to build in a right track? Deputy Spokesman: Regarding Mr. Fernandez‑Taranco, as you know, he heads our peacebuilding support office, and that is the work that he does. He has travelled to Bangladesh in the past, and he will do so again as circumstances allow. Ultimately, that depends, of course, on the willingness of the parties to deal with each other. And we encourage them to do that, to be willing to deal with each other in a peaceful and amicable fashion. We regard, of course, the question of the deaths of different people, including of secular activists, of people from the Hindu and Buddhist communities and others with extreme concern. That's essentially a separate issue, where you've seen attacks by extremist elements against different communities. And you'll have seen the concerns that the Secretary‑General and the High Commissioner for Human Rights have expressed, and we reiterate those again today.